His eyes were fixed on the Mother's face. All of a sudden everything disappeared from his sight. In a whirlpool everything seemed to dematerialize while his eyes were wide open. The temple, the people and the surroundings vanished from his sight. No singing reached his ears. The entire universe with its duality and diverse nature disappeared. He lost his own individuality, and even the Mother's form vanished from his sight. Though he wanted to call or shout aloud, he could not move or speak. He felt as if he were moving out of his body. He experienced that he was different from his body. Then he beheld the entire universe flooded with effulgence. His eyes could not stand the light. Slowly the light solidified into a form. While he was experiencing great difficulty in seeing, the effulgence evolved into the fierce yet enchanting form of Mother Kali dancing on the chest of Lord Shiva. There was the Great Mother's infinite spiritual glory and splendor, Her protruding tongue, big red bulging eyes, and the divine weapons which She held in Her numerous hands. Awesome as She was, the devotee was so relaxed and blissful that all the fears he had before dissolved. He expressed it this way: "Her form was such that even Lord Shiva would be afraid to go near Her, but the compassion, love and spiritual bliss which I experienced were like ambrosia, so soothing to the heart that they removed my fear and delusion. Gradually everything returned to normal, and the devotee was thrown back into the realm of time and space. Coming back to his normal consciousness, the devotee fainted and fell backwards from his sitting position. Some other devotees who attended to him found him perspiring profusely and breathing irregularly. After taking a few gasps of air, he remained breathless for a while. As time passed people became worried, not knowing what was happening to him. Mother, who had been watching the whole scene with a mischievous smile on Her face, sent a rose that She took from the garland She was wearing with instructions that it be held close to his nose. As soon as the rose was placed near him, he began to breathe normally. Then he opened his eyes and sat upright. The expression on his face revealed much serenity and bliss. As if returned from another world, the devotee looked around to re-orient himself. Finally, he kept his gaze on the Mother's countenance. A special, sweet smile of inexpressible joy lit his face as he sat in deep meditation throughout the night until the Devi Bhava Darshan was over. The next morning he was still full of bliss and peace. He confessed, "I am unable to control the spiritual bliss I am experiencing which comes from deep within. 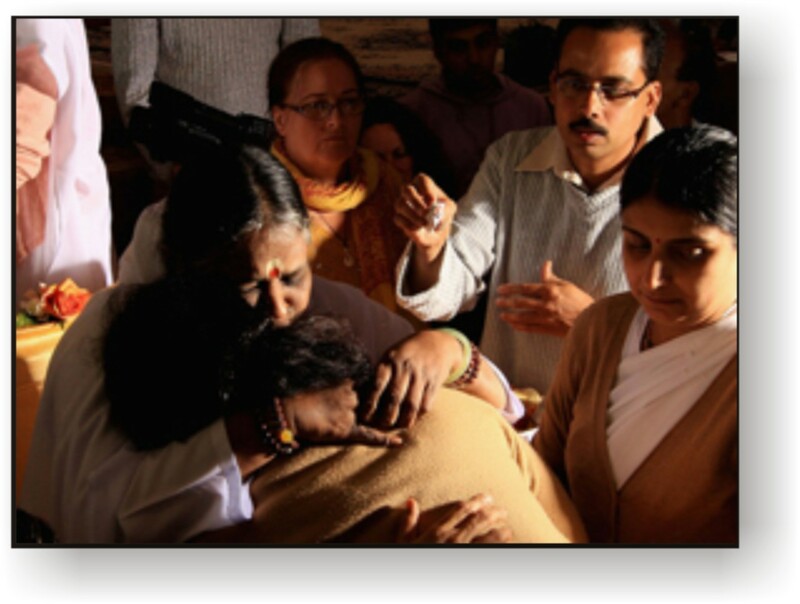 It is a rare experience that Amma has bestowed upon me." The brahmacharin to whom this experience was being told felt envious of this middle-aged man who had been given the rare blessing to behold the vision of Mother Kali. The Mother kept looking at him. There was an expression of tremendous motherly love and compassion on Her face. A few moments passed as the Mother kept quiet, yet not turning Her face away from this devotee. He began sobbing like a little child. He covered his face with both hands and fell on the Mother's lap. With great love the Mother rubbed his back and tried to console him, saying, "Son... son... don't cry, don't cry." But he couldn't help crying. Then She lovingly put him on Her shoulder and whispered something into his ear. As soon as She did this, he burst into a sudden stream of blissful laughter. He jumped up and started dancing. Laughing and crying at the same time with tears of joy rolling down his cheeks, he shouted, "Kali! Kali! 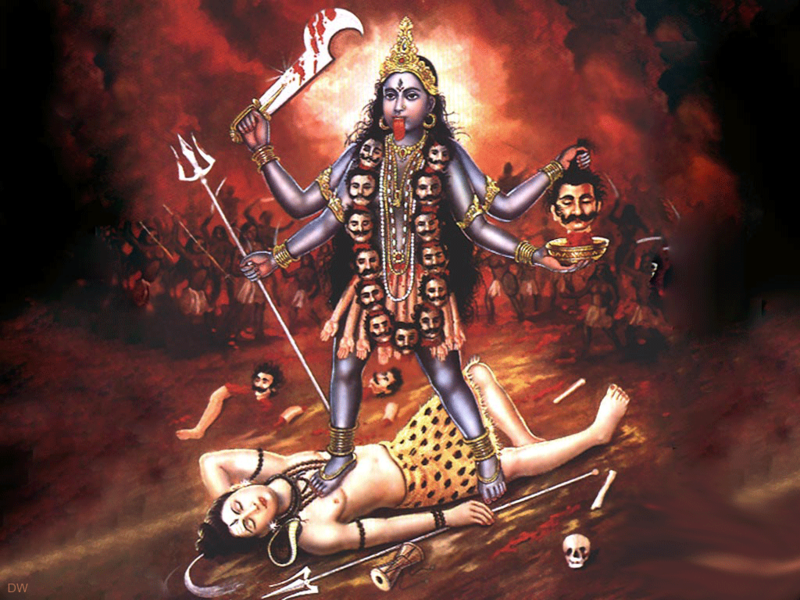 Mahakali... Kali has come as my Guru and Ishta Devata. Kali! Kali! Kali..." He kept on repeating this until the Mother finally laid Her right palm on his chest to calm him down, and he returned to a normal state. Later he related that this blissful mood lasted for about two weeks. He revealed that indeed the Holy Mother had whispered in his ears that She was the one who had given him the darshan and that She was Kali. That was the reason for his rapturous joy.